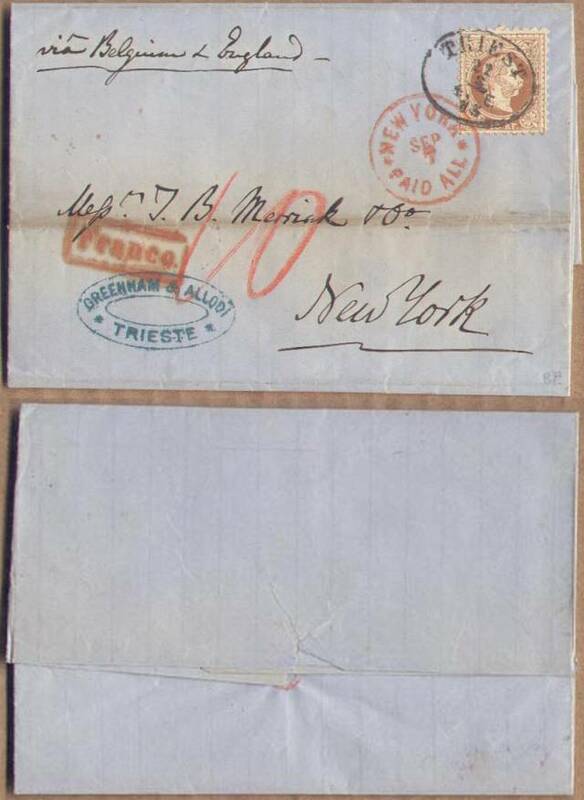 This folded letter was sent from Trieste at the north end of the Adriatic. It became part of Italy after World War I.
typographer Emperor Franc Joseph (Scott 31). FRANCO indicating the letter was prepaid. The Trieste cancel is a single rim oval dated August 22. The sender, Greenroom & Allied applied a blue oval hand stamp. The sender requested service via Belgium & England. There is no evidence of entry into the British mails. The cover arrived in New York on September 7 and received a PAID ALL cancel. I believe that the script 10 reflects the credit New York received for delivery. It would be nice to read the contents of the message. The correspondents suggest a purely commercial relationship. *Thanks to Paolo von Bagaglio for catching my several typos on this page.